At the Killino Firm, we know highway safety. We are familiar with the severe and life-altering injuries that are often associated with truck accidents and serve as tireless advocates for victims of truck accidents and across the country. 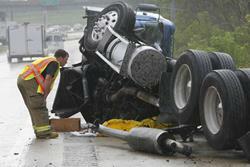 At the Killino Firm, our truck accident lawyers are not afraid to take your case to trial. We are fully prepared to stand up against the largest truck companies across the country and fight aggressively on your behalf. Truck companies, large and small, have a responsibility to American safety. If you or a loved one has been harmed or killed in a truck accident, you will most likely qualify to seek and recover compensation for your losses. For more information about your personal circumstances, contact a trucking accident attorney today.